Thu., March 2, 2017, 9:24 p.m.
MADRID – Luis Enrique’s surprise announcement has left Barcelona surrounded by uncertainty. Although the coach had been under pressure and many expected him to be replaced next season, few anticipated he would reveal his intention to leave with three months left and with the team still contending for titles. The announcement – on the night Barcelona regained the lead in the Spanish league – quickly turned the focus away from team’s recent successes on the field and brought attention to its uncertain future. Seconds after Luis Enrique said he needed to rest and would not return next season after three years in charge, speculation began about who will be the next coach for one of the most dominant clubs in the last decade. Sevilla coach Jorge Sampaoli is among the top candidates to replace Luis Enrique next season. The 56-year-old Argentine coach was sought-after by several clubs and national teams after leading Chile to its first Copa America title in 2015. He eventually joined with Sevilla, and has helped the club become a contender for a league title for the first time in years. Another rumored candidate is Ernesto Valverde, currently with Athletic Bilbao. He led the Basque club to some of its greatest successes recently, including victory over Barcelona in the 2015 Spanish Super Cup, which gave the club its first trophy in more than 30 years. Barcelona still has the chance to win three titles before Luis Enrique leaves – the Spanish league, the Copa del Rey and the Champions League, although the latter is unlikely because it must reverse a 4-0 first-leg loss to Paris Saint-Germain. 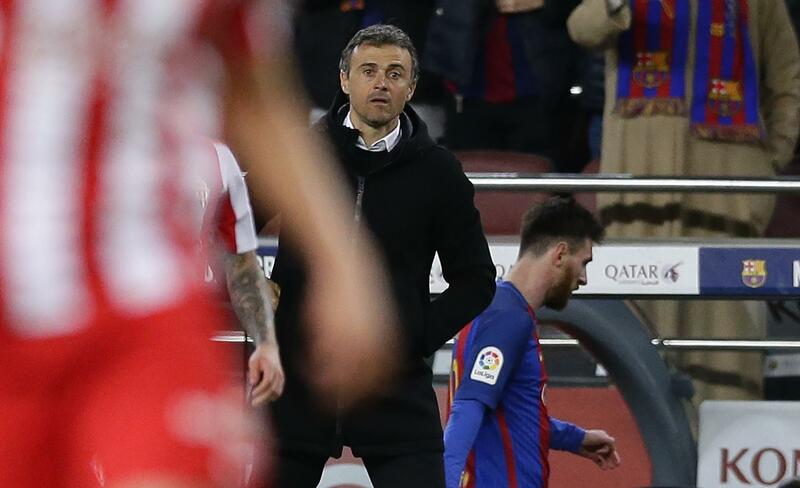 The 6-1 rout of Sporting Gijon on Wednesday – the team’s fifth win in a row – left Barcelona one point ahead of Real Madrid in the Spanish league, a competition it won the last two seasons with Luis Enrique. The Catalan club will play Alaves in the final of the Copa del Rey, which it also won the last two years. Luis Enrique’s announcement caught players by surprise, but club president Josep Bartomeu was quick to say that they will be motivated to help the club win again before the coach leaves. The squad learned of the decision moments after the win over Sporting Gijon at the Camp Nou. Luis Enrique had been under pressure since the humiliating loss to PSG in the Champions League, which was likely the team’s worst defeat since he took over from Gerardo Martino ahead of the 2014-15 season. But the former midfielder won eight of 10 possible titles with the club during his current coaching stint, including the treble of the Spanish league, Copa del Rey and Champions League in his first season in charge. His other titles with Barcelona include the 2015 UEFA Super Cup and the 2016 Spanish Super Cup, as well as the 2015 Club World Cup. “We had a super coach during three seasons,” Bartomeu said. Published: March 2, 2017, 9:24 p.m.